Fingerlings were fun to play with when you carried them around on your finger, but what if they were bigger, cuddlier, and still just as interactive? 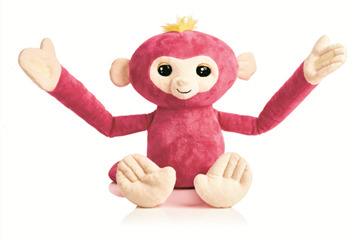 With Fingerlings Hugs, you get a stuffed animal version of the Fingerlings monkeys that reacts to touch, motion, and sounds with opening and closing eyes and more than 40 sound effects. There are a lot of different things you can do with your Fingerlings Hugs. It has Velcro paws that you can connect for a monkey hug. And when you press your Fingerlings Hugs' mouth to your skin, you'll hear a kiss. Throw the monkey in the air or spin it around for fun reactions. Give it a shake or pat its back for some silly and gross reactions. It will even repeat what you say in a monkey voice when you press and hold its left ear. Hold it upside down and shake it for more funny sounds and press your fingers against its mouth to hear it blow a raspberry. And if your Fingerlings is lying down, you can tickle it, hear it blow you a sleepy kiss, and rock it to sleep. The Fingerlings Hugs are available in Bella the pink monkey and Boris the blue monkey. Each is sold separately. These are really cute and interactive plush toys that will be fun for kids who are fans of the original Fingerlings. And because kids can swing them around, have their monkey hanging off their neck, and give their monkey lots of hugs, we think these might even be a little more fun than the originals. Kids will have a lot of fun monkeying around with these plush characters. Fingerlings Hugs are for ages 4 and up. Kids who are fans of Fingerlings will like interacting with these huggable new versions. These require two AAA batteries, which are included for the in-store try-me features, but we recommend replacing them before you play for best results. 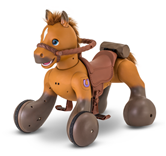 For years, I’ve been a fan of these toys from WowWee — a great example of a small toy company rising to the top through technology and innovation that encourages play. The maker of Fingerlings, 2017’s breakthrough toy, WowWee is bringing this favorite back in a big way — literally. While the original Fingerlings, dubbed “friendship @ your fingertips,” are interactive monkeys small enough to hang on your finger and react to noise, motion and touch with cute monkey noises, at 24-inches of plush, the new monkeys’ arms stretch out to 20 inches — making the new addition to the family is much larger and softer for big hugs. And unlike its smaller versions, Fingerlings Hugs can record your voice and repeat back what you say in funny ways. When I played with Fingerlings Hugs Bella (one of the four original characters to launch throughout 2018), by swinging her around, she repeated my name after I recorded it, kissed me and giggled “Weee!” when I threw her up in the air. And for those who love the original Fingerlings, look out for more this year, including Fingerlings Sloths which have already hit shelves. Fingerlings Hugs is a fun, mischievous, big softy that children can share on a playdate as well as comfort them when they’re alone. And with this monkey’s happy personality, it’s bound to bring out a child’s happy side, too.